Now’s as good a time as any, as we’re sixteen reviews into our history of rock that promises to take us to the present time of 2017 (sometime probably around the year 3017), to tell readers a bit more about what is being reviewed, and conversely what won’t necessarily make the cut. As stated in the site intro we’re covering rock ‘n’ roll’s entire history but considering there’s roughly a half billion rock records to date, large and small (I made that number up, don’t bother correcting me on it! ), obviously we can’t review each and every one. I harbor dreams about eventually covering the singles from my own era here and to do so I either have to write a lot faster or judiciously pick and choose what gets featured along the way. Rest assured all of the major records and artists will be here, along with plenty of also-rans and never-weres. After all telling rock’s full story means showing not only what hit big but also what flopped. It means deliberately heading down creative dead-ends then backing up and returning to the busier roads that wound up leading somewhere with a few more sights to see. Consider Spontaneous Lunacy to be “rock’s full history, warts and all”. Yet that still means stuff gets left behind for no other reason than time and space considerations. So it’s only fair to warn you that one of the things that will get a bit shortchanged here over the years is going to B-sides, for what I hope are obvious, and understandable, reasons. Record companies in the singles era – not to mention artists themselves – put the majority of their focus on the A-sides of their records. Those are the ones they worked hardest on, had the highest expectations for and pushed the most, not to mention the ones that most often got heard by the masses. Sometimes they were usurped by an unexpected B-side that the audience preferred but for the most part when you want to see what everyone involved were thinking was the best bet for their artistic and commercial solvency look no further than the A-side of most releases. But B-sides aren’t always throwaways, and even when they were they often tell a story every bit as important as what’s found on the promoted side of the platter. When that happens, or when the song itself is interesting – whether a hit or not – then the B-side will get its moment in the spotlight here too. Why bring all this up now? Because here’s a B-side that may help shed a little light on what the industry itself was thinking as rock ‘n’ roll emerged. 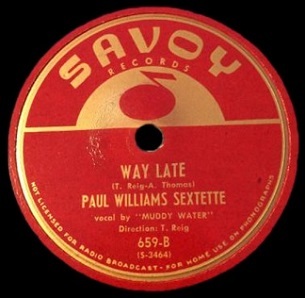 Paul Williams was signed to Savoy Records as a saxophone playing bandleader. He was promoted as the featured artist. His name was most prominent on the label, he was the guy they were casting their fate with. Yet in 1947 that might’ve been a risky move. Instrumental records certainly were successful in other fields, jazz let’s say, but in this new realm that aimed for a grittier sound intended to reach a more uncouth audience with one nickel left in their palm and twenty or twenty-five records on a jukebox all vying for that money, would an instrumental be the surest bet for pulling that buffalo in? All to hear, what might be considered if you looked at it a certain way, just HALF a song? So it was heartening to see Williams take a rather bold first step down a dimly lit path that hadn’t really be trod upon much yet when he cut the flip side of this, Hastings Street Bounce, a fairly rousing instrumental that set into motion a style that would come to dominate the next two years of rock. But, whoever’s decision it ultimately was, it’s also not surprising to hear him revert to at least a slightly more typical backing role for Way Late. Not surprisingly this has a much more readily identifiable sound and structure that connects it to the scene springing up, at least the part that’s already in place. Williams plays a lurching groove behind T.J. Fowler’s gently surging piano while a singer identified on the label as “Muddy Water” (no, not THAT Muddy Waters, soon to be Chicago blues kingpin… showing just how early in the game this release was, not just for rock, but for the unrelated urban blues too, as Waters, a/k/a McKinley Morganfield, was still unknown) delivers the vocal in serviceable fashion. For the record Water (minus the s) was in fact Alex Thomas. There have been a lot of Alex Thomases in music over the years but we know for sure it’s not the British drummer, nor the Earth, Wind & Fire trombonist, but it quite possibly could be the Cleveland gospel singer who was active around that time. Whoever it is he’s got fairly good command of the idiom, delivering his lines with strong self-assurance and a decent tone. He sounds almost like a minor league version of Cousin Joe, who’ve we met already, but without quite the full arsenal of charisma or power. On the whole though he serves a useful purpose here, delivering the story (for which he earned a co-writing credit) with some panache. As for the song itself… let’s just say it fits. It fits into the repertoire of Williams, establishing his music as a bit more varied than had he stuck entirely to instrumentals from the start. Most importantly it fits the burgeoning style of rock, giving us a somewhat draggy mid-tempo cracked morality tale about a rather loose woman who is driving her main man, the singer, crazy by going out each night – presumably with other men, whether to just drink and dance or to screw around – and then acts as if it’s no big deal when she returns to him the next morning. For his part the cuckolded Thomas seems willing to put up with this as long as she just tones it down somewhat, maybe keep it a little more discreet so he can at least pretend he’s still got some self-respect left. While he says that My love ain’t like whiskey, darling/like you buy in the whiskey store, and insists that he’s going to leave soon it’s obvious he’s laid down the law to her before this and she laughed in his face and kept right on hitting the town so there’s absolutely no reason to think she’ll listen this time, or that he’s going to grow a backbone now and do something more than just offer feeble protests. Thomas’s weary vocals, while suitable for the song itself, nevertheless sound just a little anachronistic, as if he hasn’t been told this type of music they’re laying down requires a more modern approach. Though he gets slightly more aroused by the end as his indignation rises he’s hardly vibrant in the way you’d like to see, never railing against his woman with the appropriate fire that it calls for. It’s not hard to envision that Thomas was thinking more along the lines of a standard blues delivery while the horn-dominated band clearly wasn’t equipped for that. They don’t exactly clash, Williams and company keep him within their sights the whole time, but as a result of the slight disconnect that exists neither Thomas nor the band are able to elevate it beyond just a basic pastiche of two disparate stylistic cousins crossing paths in the dark. Though lyrically appropriate for rock’s narrative at this point, and fairly well told at that, there’s nothing particularly special about the song either, no unexpected twists in the story, no surprises lurking beyond the next refrain, no clever put-downs to elicit a grin, but it doesn’t make any missteps along the way. The steady churning groove remains strong throughout and Williams delivers a serviceable solo that at least confirms his position as the main attraction on the label. Everything is at least in its rightful place in other words, but nothing about it stands out, or likely was intended to. As B-sides go it’s not bad, but certainly not anything you’d be flipping the record over to hear very much. What makes this notable in rock’s early evolution is the implied thought behind its creation which suggests that those involved felt that the instrumental approach alone would have limited commercial possibilities. Not so much that it wasn’t worth doing, but rather that it may have seemed risky to put all of your eggs in that particular basket and so to hedge their bets they chose to take a different tact with the B-side. Truthfully, that’s not such a bad outlook in general terms. Having two-sides to a record allows for diversity so why not take advantage of it, provided the styles compliment each other in some way. So you can’t blame Williams, or Herman Lubinsky, Savoy’s tightfisted myopic owner, or A&R man Teddy Reig for broadening Williams’ palette right away. It made sense stylistically and commercially. Though the results themselves weren’t anything special, the idea definitely has the look of a more well-thought out plan, and sure enough on Williams’s next release, also cut at this same session, Thomas was featured on the B-side as well. It just so happened that the events that transpired with that release changed those plans once and for all in ways they likely couldn’t have foreseen at this point in time. So for those familiar with the name Paul Williams and his position as the first rock instrumentalist, hearing this vocal record coming out under his name so soon might seem a little out of place, even hinting of a repudiation of his potential in some perverse way. But rather than being a concession to musical timidity as feared, it actually ventures down a parallel road to the main one he’d travel. That the two paths – vocal and instrumental – would remain connected as rock progressed was ultimately a good thing, even if the initial reasons for doing so may have been rather cautious by nature. Leave a reply on "Paul Williams: “Way Late”"